IS EYE DILATION NECESSARY IN AN EYE EXAMINATION? All eye checks ups (unless they are post surgery checks or specified by Optometrist or your eye doctor) need to be completed with a dilated eye examination. Eye dilation during an eye examination means the use of dilating eye drops (called mydriatics) which widens the pupil (the black circular opening in the centre of your coloured portion of the eye (iris). This dilation is usually done with your eye doctor and not with the optician (at least not in India). How is it done? Dilating eye drops are used at short intervals, till the pupils enlarge or dilate. This can be achieved with just one dose in some, whereas others may require repetition of dilating eye drops to achieve satisfactory dilation. 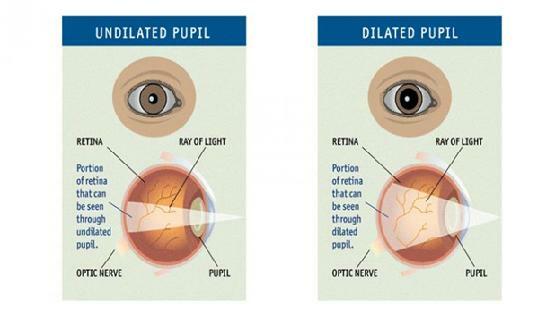 The dilation effect is checked with torchlight, and usually termed as ‘partially dilated’ or ‘fully dilated’. For some conditions or before procedures or surgeries a full dilation is necessary to be able to visualize the inside of the eye. Once the pupil is fully dilated (which takes approximately twenty to thirty minutes after application of the eye drops) one can easily examine or view the entire retina through a larger aperture. In adults we use Tropicamide eye drops and its effect lasts usually for 4 hours. In children (below age 12 years) we use Homide eye drops and its effect lasts usually for24 hours. Why is dilation necessary? The retina is the only place in the human body where blood vessels and nerves can be directly observed. It is very important at revealing the status of your optic nerve and retina, and critical to preventing and treating eye conditions that could potentially lead to vision loss. Several diseases and conditions can be detected in their earliest stages diabetes: 1. Diabetes- Diabetic Retinopathy 2. High blood pressure- Hypertensive Retinopathy 3. Age Related Macular degeneration- ARMD 4. Retinal detachment 5. Eye tumors 6. Glaucoma- by observing optic nerve changes Patients who visit with redness in their eye question the need for a dilated eye examination. All red eyes are not due to infection, and hence dilation is necessary to ensure that the redness is not due to any internal eye problem. Dilating drops are sometimes used in children to test accuracy of prescription) as this disables the child’s ability to use their eye muscles to “squeeze” their eyes or squint and try and read a line or two more. Hence, eye examinations for an accurate prescription, especially in children may need more than one visit to the doctor’s office (cycloplegic refraction or PMT post mydriatic test). In children we use Homide eye drops for the following reasons:- 1. To check the internal eye completely 2. To check the numbers with accuracy as the internal eye muscles are strong in children and sometimes the child can compensate the refractive error leading to erroneous prescription numbers 3. The answers sometimes are not reliable, so in order to reveal the refractive status (spectacle numbers) properly we need to dilate the eyes. Is dilation necessary at every eye exam? The simple answer is no, not every exam requires a pupil dilation, BUT an annual examination or an examination in patients with retinal conditions; it is an important step for thorough eye examination. Each patient is different, and the absolute need for dilating your eyes may be different than for a different patient. In some cases of Glaucoma, one needs to be careful not to dilate the eye fully, that it could cause increase in eye pressure. Hence, it is best to allow your treating doctor to take the decision of whether to dilate or not. What to expect after the dilation? 1. It is difficult to focus on objects close up for a few hours after your exam. Hence, do not plan to head back to work immediately. 2. Eye dilation also makes your eyes more sensitive to bright light. 3. You may need to make arrangements to have a friend or family member drive you home or take a local transport as driving post a dilated examination is not recommended due to blurred vision. In our centre, patients reserve the right to refuse any test or diagnostic procedure, despite our recommendations. If a patient refuses a dilated eye examination, he or she assumes the risk for detection and diagnosis of related conditions; hence some centres such as ours request a signed waiver in these cases. OCT Angiography: The Newest Frontier and Future for the Revolutionary Technology of Imaging in Eye Care What is OCT Angiography (OCTA)? Optical Coherence Tomography Angiography (OCTA) provides three-dimensional (3D) imaging of the anterior segment, retina, and optic nerve head (similar to a C T Scan of the eye) allowing early diagnosis and timely management of eye diseases. Indications: Used to diagnose and manage retinal diseases which are major causes of blindness such as: • diabetic retinopathy • age-related macular degeneration (ARMD) • artery and retinal vein occlusions (BRVO) • glaucoma Advantages over FFA • A high-speed device- produces images in 10-15 seconds; FFA takes over 10-15 minutes • Non invasive; FFA needs injections • No dye injected, instead uses motion contrast. Hence no leakage, staining and other side effects such as nausea and severe allergic reactions (anaphylaxis) • Can acquire different scan sizes in the macula and the optic disc in about 3 seconds • Can scan the other eye in same sitting, unlike FFA, which is one eye per sitting • Provides accurate size and localization. FFA results are highly variable and often obscured by subjective interpretation by doctors • Visualizes both the retinal and choroidal vasculature • Can be used for routine screening examinations for early diagnosis of vascular abnormalities, and for routine follow-up examinations to evaluate the efficacy of treatments such as intra-vitreal injections. "With OCT angiography, we now have a noninvasive, safe, and effective tool to visualize the earliest pathological changes in the most common diseases that cause blindness, leading to earlier diagnosis and more successful treatments”, says Dr Rahul Shroff, Vitreo Retinal surgeon at Shroff Eye, Mumbai.